Receive SMS online via our short code number or your inbound text messaging number with Voodoo SMS. Our online SMS gateway lets you receive SMS from customers, prospects and anyone that receives your outbound text messages. 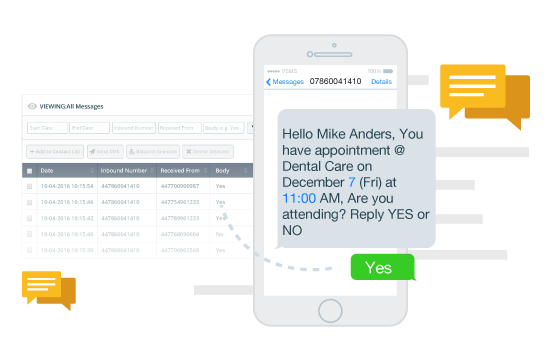 Using Voodoo SMS, you can add a custom keyword to each of the text messages you deliver, allowing recipients to respond. Using a custom keyword increases your response rate, helping you achieve a better return on investment from your SMS campaign. Below, we've explained the two ways you can receive SMS online using Voodoo SMS, as well as the options you have to automatically forward or respond to messages from your prospects and customers. Our short code number makes it easy for people that receive your text messages to respond to your campaign. When you deliver messages from our short code number (88440), you can add a keyword to your message to encourage recipients to respond. For example, you can deliver a message that ends in “Text CODE to 88440 to claim your offer now” to encourage people to take action. Our SMS platform also allows you to send your message from a custom sender ID to further increase your response rate. There are two ways you can receive SMS online with Voodoo SMS. You can deliver your text messages using one of our shared long numbers with a custom keyword. People that receive your message can respond just like they would with our short code number. Or, you can use your own dedicated Virtual Mobile Number (VMN) so that recipients can respond to you without having to send a keyword. When you use a dedicated Virtual Mobile Number (VMN), you can store all responses in your account and even forward incoming SMS to your email address. When you use your own dedicated Virtual Mobile Number (VMN), there's no need to include a keyword in your outbound message. People that respond to your campaign can contact you directly using your Virtual Mobile Number (VMN) to claim your offer or speak to your sales team. With Voodoo SMS, you can program automatic responses to incoming SMS so that people who contact you receive an instant response. Autoresponder messages are great for informing your customers that you've received their message and will follow up with them as soon as possible. For example, you can send an automatic “Thank you” message to people that respond to your offer with an estimated time for your team's contact. There's no fee to start your Voodoo SMS account, and our volume-based pricing means you can pay as little as 1.74p for each text message you send. Create your free account now to launch your SMS marketing campaign with Voodoo SMS.